Cardamom essential oil is luscious, rich, exotic and entirely aromatically unique. It has a soothing, uplifting emotional affect. It exerts a fortifying influence on mental functioning, reducing drowsiness and improving concentration. Renowned for its grounding powers, this member of the ginger family has a gentle character, making it ideal as a warming addition to massage oil blends for most skin types. Its Botanical Name is Elettaria cardamomum. Blends With : Rose, bergamot, orange, cinnamon, caraway, cloves and cedarwood. Constituents - a-pinene, sabinene, b-pinene, myrcene, limonene, 1,8-cineole, a-phellandrene, y-terpinene, p-cymene, linalool, linalyl acetate, terpinolene, terpinen-4-oil, citronellol, nerol, geraniol, a-terpineol, a-terpineol acetate, methyl eugenol and trans-nerolidol. Benefits- The healing properties of cardamom oil can be attributed to its qualities as an antimicrobial, antiseptic, diuretic, aphrodisiac, digestive, stomachic, and stimulant. If used properly and in appropriate doses, it can be an effective way to help maintain your health. This essential oil can Stimulate the entire digestive system and Help dispel toxins from your body. Aromatic Description - Spicy, woody, rich, sweet. 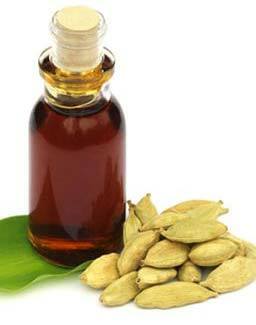 Cardamom Oil Uses : Cardamom oil is particularly helpful for digestive system and works as laxative in soothing colic, wind, dyspepsia & nausea (Even nausea in pregnancy). It also warms stomach and helps with heartburns. Having a refreshing and uplifting effect, the oil’s expectorant properties help clear coughs as well as a well-known remedy for impotence & low sexual response.